After a decade-long boom in both oil production and job growth, the oil industry may be in for a major setback in 2015. Crude oil is trading below $50 a barrel, and drilling is grinding to a halt in the U.S. because few shale producers can drill new wells that produce oil economically for $45 to $50 a barrel. As the industry slows to a crawl, companies are beginning to announce layoffs. It's a natural by-product of a slowing business environment, but it could come as a rude awakening for thousands of oil industry workers around the country. Some companies are already beginning to lay off workers; public releases put the job losses at 31,000 by late January, a number that will continue to rise sharply throughout 2015. Energy industry service provider Schlumberger (SLB) has made the most dramatic move, cutting 9,000 workers in anticipation of slowing revenue this year. The company provides a variety of products and services to shale drillers, so as activity slows down, so will its business. %VIRTUAL-pullquote-More than 1 in 100 of all workers in the U.S. will be directly affected by falling oil prices and slowing production.%Fellow service supplier Halliburton (HAL) announced 1,000 job cuts in December and on a recent conference call said it expected more layoffs in the near future. Baker Hughes, which Halliburton agreed to acquire late last year, just announced 7,000 job cuts, 11 percent of its workforce. By the time the merger closes in late 2015, the combined entity could be significantly smaller than anyone expected. "We will have to make reductions to our structure as any prudent business would," Halliburton CEO Dave Lesar, adding that market conditions are driving the layoffs, not the merger. No matter the reason, when three of the largest oilfield service providers in the country are announcing layoffs by the thousands, it's troubling for the industry. One reason the picture isn't already worse is that there's a long lag between dropping oil prices and falling employment in parts of the industry. Drillers like Whiting Petroleum (WLL) and Continental Resources (CLR), two of the largest drillers in the Bakken Shale, are still producing oil from wells drilled in 2014 and will still be fracking them in 2015. But if new wells aren't being drilled, there's only so much that can be done before additional workers will go idle later in the year. With 2.1 million people employed by the energy industry, more than 1 in 100 of all workers in the U.S. will be directly affected by falling oil prices and slowing production. According to the U.S. Bureau of Labor Statistics, 216,000 workers are in oil and gas extraction alone, up from 121,200 in 2004, the last time the price of oil stayed below $50 per barrel for an extended period. Many industry experts continue to be bullish on the future of oil drilling. T. Boone Pickens and Continental Resources CEO Harold Hamm have been two of the biggest cheerleaders, predicting that the price drop will be temporary. But they have a vested interest in being bullish on oil because that's how they've made their billions. We may actually not be in for an imminent recovery in drilling. OPEC has decided to maintain its 30-million-barrel-a-day production target, leaving the world oversupplied by 1 million to 2 million barrels a day. Someone will have to cut production to send prices higher. The problem is that Russia, Saudi Arabia and the U.S. combined are expected to produce more oil in 2015 than they did last year. That only makes the situation worse, even if U.S. producers stop drilling new wells. On the demand side, the U.S. and Europe have both seen oil demand drop slowly over the past decade. China has been the main country propping up global demand, but it's uncertain whether China's economic growth is going to slow down in 2015, as some fear, or continue steady expansion. At the end of the day, China's demand may have more to do with oil prices than most people think. If oil stays below $50 a barrel, the industry could be in for major cutbacks in 2015, and I wouldn't be surprised to see a handful of highly leveraged oil producers go out of business. At least 31,000 jobs have already disappeared from the energy industry within the last few months, and if the price of oil remains this low, that number will easily top six figures by the end of the year. 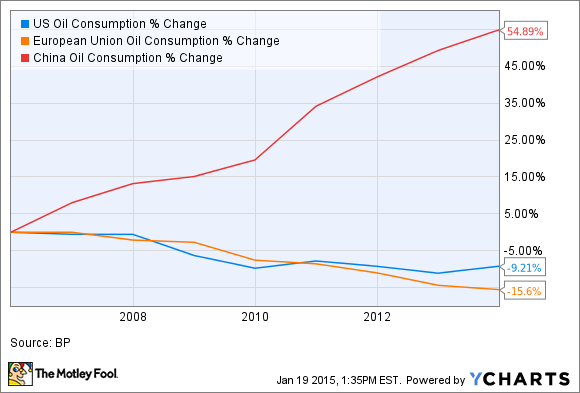 This is the boom-and-bust nature of energy in the U.S. It's really good when energy prices are high, but when the market busts, the U.S. oil drilling industry could quickly become a ghost town.